Going to look at a jx-3p tomorrow and apparently it has several dead keys. I have no more information than that until I get to look at it. What tests can I do to try and figure out what the problem might be? I'm obviously hoping it's something simple like dirty contacts. Is this the sort of problem on jx-3p that could turn out be a money pit? Maybe test for a voice issue? Last edited by elsquirrel on Wed Apr 01, 2015 12:52 pm, edited 3 times in total. Damn I wish I had had more time to get info on this. I got to test it briefly and found there were a keys not working as described. Unfortunately I didn't know how to program it well enough. I did the voice test and all 6 we were working, so I thought it looked pretty good it was just the key contacts. Nothing on the fifth octave. Also, the second oscillator (maybe it was the first I need retest) won't sound when you play certain keys. It seems to cycle around and is not consistent to anyone key. I'm going to try and take it back, but any info would be great. Or any links to to sites with info. Dead keys are probably the least of your worries. I'd be worried about the red and white residue on the circuit board! It looks like someone spilled something in there and then corroded a bunch of stuff. That about as technical as I can get. But if both oscillators are working, at least some of the time, that does seem encouraging. How much money was it? How much time do you have to play with it? synthroom wrote: How much money was it? How much time do you have to play with it? It's too painful to relate the story. I'm stuck with it now so I'll just to have to try and get it going or use it for parts. Yeah I figured this too. Hopefully it's all related to corrosion on the board (and can be fixed!). Although I just realised the brilliance control isn't working either. I used a pair of headphones and cranked the volume and it's DCO 1 that has issues, but it does actually sound, just at a very low volume. I guess the first step is trying to clean the board. Any recommendations on how to do this? I guess I'll have to remove the chips to do it properly? Without removing any components I cleaned away the residue on the main board. It came off easily and didn't appear to have corroded anything. There still some gunk under the chips and between the legs, so it's not really conclusive. At any rate, this had no effect. Same issues with dead keys. I tested it over midi and the dead keys respond fine to midi notes. The dco issue I guess is a voice issue? It sounds but very quietly, and seems to cycle around an octave. Not sure how to proceed on this. Probably over my head. 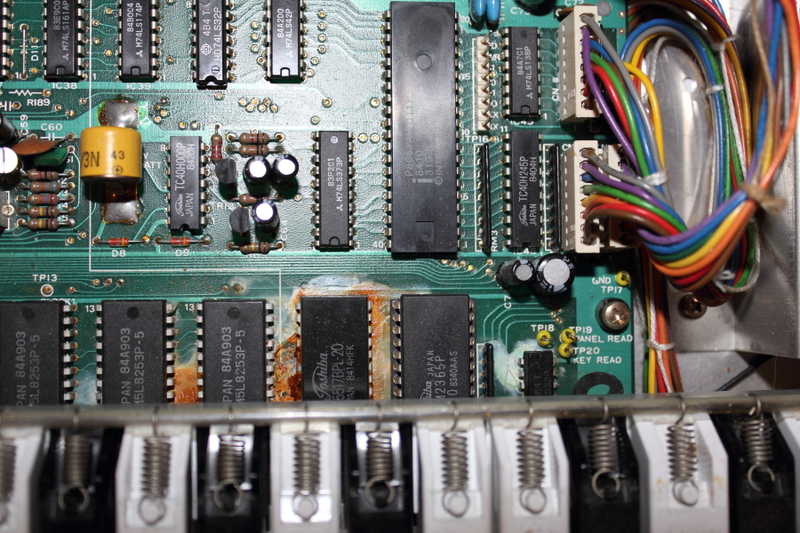 Does anyone know the function of the chips on the bottom right hand of the board bathing in the residue? I can see panel read/ key read on the very right, but I don't know what that refers too. That's lucky there was no corrosion. I'd keep working on getting the rest of the gunk off, even under the chips. Any way to slide a cloth under the chips to give a little scrubbing action? They run a couple hundred bucks but think of it as an investment! have you found schematics for it yet? That should answer your IC ID questions. That looks like the master oscillator clock dividers on the left there and the user preset RAM surrounded by corrosion. I'd take 'em off, carefully mind, and clean the lot (board, through holes, ICs - also carefully) and check for corrosion anywhere else too. If it's not a per-voice issue and more of a key assignment issue, that might sort it. Those counter ICs are still available, but that RAM would be a possibly long search if it's damaged. Can you store sounds OK? If so, the RAM might well be dirty but functioning fine, but those corroded pins look nasty. I'd be tempted to find a replacement. Make sure to test all the circuit board traces in the area for continuity as well. I have all the chips available if you need any. synthroom wrote: If you need to desolder chips, get yourself a desoldering station. s.
I don't really have the $ for a proper setup right now. It looks amazing though. All I have is one of those cheapo hand suction ones. nathanscribe wrote: . Can you store sounds OK? . Yep, patch storage seems fine. I'll report back with any further news. I haven't touched the 3p in a while besides the occasional plug in to jam on the few keys that work and give it a dust. I ran the problems by the closest tech who said repairs would probably run at least $400. What would be the next best tool besides an expensive desoldering station? I only have one of the suction pumps that doesn't work very well. I used to to remove a bad chip from juno 106 but had a h**l of a time doing it. I'll check the traces tomorrow. Anything else I might try before I attempt to remove the chips? Save up for a mid-range desoldering station, seriously. Everything else will just be pain. IMHO, key contacts are bad on those keys. The foil contacts on the board under the keys are about one atom thick - DO NOT scrub, scrape or sandpaper! They will disappear! The rubber contacts are also less than perfect. You may be able to find them at Syntaur.com I was able to get a pair of key contact boards from them also. Asshat who owned the one I bought (as is) had ruined the copper contacts, then taped strips of aluminum foil onto the remains.Worked like a charm - NOT!!! The key scanning issue might just be a cable or connector problem between the keyboard and the CPU board. They look like they are all Molex connectors, and the contacts on those things loosen up after a while. Pull them off; look at the female connector ends, and if you see any contacts that have spread open, use a small scewdriver to bend them so that they tighten back up.